“In this treatise it is assumed that most of the biblical accounts are based on actual events, despite having been embellished by later editors.” Thus does Riaan Booysen head off critics who even before reading his book might accuse him of trying to denigrate the Old Testament. His work, Thera and the Exodus, is not antireligious; to the contrary, it is a well-organized, scholarly, richly illustrated, and heavily footnoted effort to prove that the great migration of the Jewish people out of Egypt under Moses did occur. Not only that, but he also asserts that the plagues and miracles associated with the Exodus can be explained and corroborated as natural phenomena. 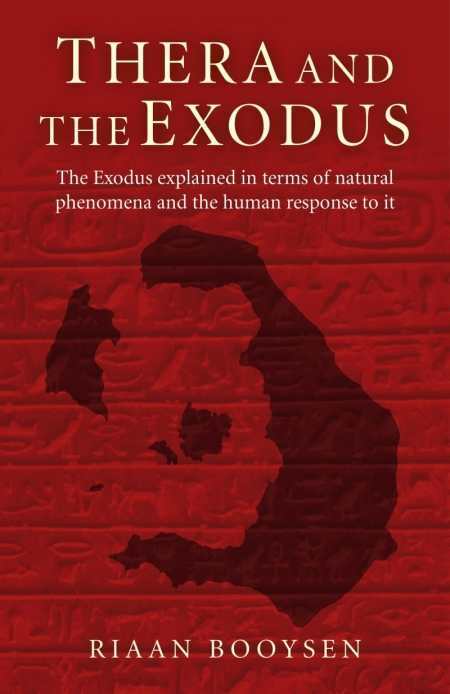 Booysen is not the first to attempt to explain the events in the book of Exodus as being the work of nature. His thirteen-page bibliography and forty-page collection of footnotes pay homage to those who have gone down this path before. Citing sources modern and ancient, historical and biblical, literary and scientific, Booysen places the Exodus in the fifteenth century BC and ties it to the devastating eruption of the Thera volcano on a Greek island in the Cyclades. Booysen is the latest in a long line to postulate that the volcanic ash generated by Thera darkened the skies, discolored and poisoned the waters of the Nile, and caused or contributed to the other plagues of Egypt as noted in Exodus. The famed pillar of fire and pillar of clouds that guided Moses to the Reed Sea (the author accepts the theory that “Red Sea” is a mistranslation) may have been Thera, says Booysen. A tsunami caused by the eruption crashed down to destroy the pharaoh’s chariots, allowing the Israelites to later escape from Egypt along the Lake Manzala ridge—the “parting of the sea” event, the author says. Booysen provides a wealth of information to substantiate his conclusion that the pharaoh referred to in these events is Amenhotep III, whose instruction to sacrifice all firstborn in Egypt led to a rebellion among the Egyptians which, he believes, was led by Akhenaten’s brother, crown prince Tuthmosis—the Moses of the Bible. Booysen’s presentation is thorough and convincing, at least as far as the story of Exodus goes. Less believable and often confusing is his supposition that Akhenaten’s queen, the famous Nefertiti, was also both the Queen of Sheba and Helen of Troy. He complicates that further by moving Solomon back in time to Moses’s era, assuming there is already a Hebrew kingdom in Jerusalem—thus at one stroke decapitating the Joshua-Jericho, Chosen People-come-to-Canaan story. This section is interesting but confusing, and its inclusion by inference weakens the author’s main thesis. Booysen states that “every legend is based on an element of truth,” but while his reasoning on the Exodus thread is solid, straightforward and quite credible, it is much less so on the Solomon-Sheba-Helen tangent. Also controversial, but truly thought-provoking, is Booysen’s varying proposals that Moses was perhaps a descendant of Joseph—or was not a Hebrew at all and a full-blood prince of Egypt. Even if readers disagree with the conclusions Booysen puts forth in the lengthy and often convoluted sidebar on Nefertiti, those who like their Bible more for history than theology will greatly appreciate and thoroughly enjoy Thera and the Exodus. Booysen’s grasp of, and evident enthusiasm for, Egyptology in particular is evident. He has delved deep into the history, legend, and archaeological evidence of the land of the pharaohs, and any who share his interests will find this book utterly fascinating and engrossing.